Hi all! Hope you all had a good weekend!!! 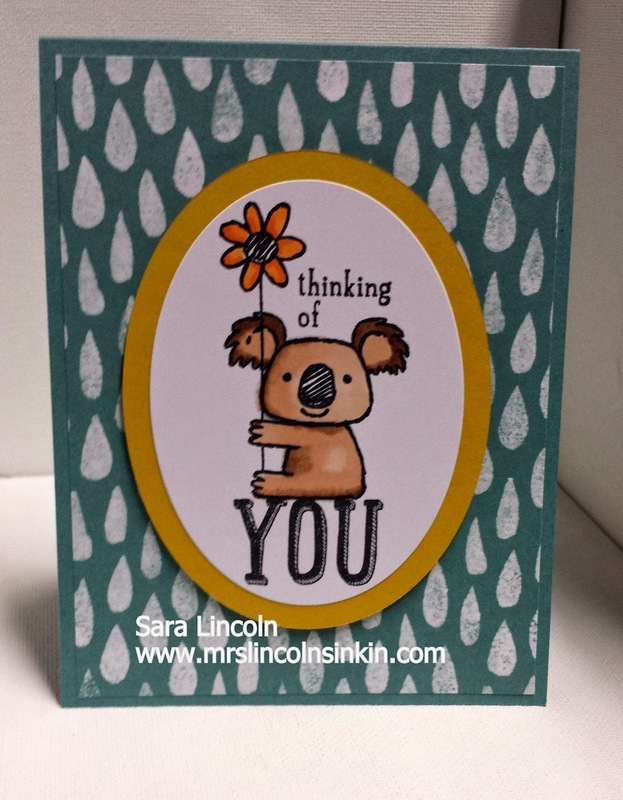 Today's share is of a card using a new set called Kind Koala. I am obsessed with the new stamps that you can color with the new Blendabilities. OBSESSED!!!!! I am still new with these markers and i'm not 100% sure how to use them. I have played around with Copic markers before and though these are similar they are still a bit different and taking me a bit to get the hang of. The base of my card is average size measuring 4 1/4" x 11" scored at 5 1/2". I found the piece of DSP from the Moonlight DSP Paper stack. I thought it looked just like eucalyptus leaves!!! I loved it! I stamped my image in Memento Black ink, this is the ink that you have to use when you are going to color with the Blendabilities. I used 2 colors from the Skin Tones Blendabilites to color in my Koala. I love it, you are doing awesome!!! !